The humidity detector FMW-T covers all your needs while measuring moisture contents in all types of wood and building materials. The humidity detector FMW-T works without causing any damage to the material and it is mainly used to measure building walls. When you have to choose a humidity detector it is very important to take into consideration whether the surface can be affected or whether it has to be in perfect condition after the measurement. Humid areas can produce mould in houses. These areas are easily detected. You will also measure humidity in wood, as for instance in parquet floors. The humidity detector FMW-T has a compact design and it is very easy to use. These characteristics turn the humidity detector into an irreplaceable device for professional builders, technicians, etc. Fitting of wood thickness (selected from memory). Measuring and reading of moisture content. - Entry of the specific weight of wood from 250 to 1100 kg/m3 in 10 kg intervals. The humidity detector FMW-T for wood is guided by a microprocessor unit to quickly determine moisture content in wood and building materials. The humidity detector FMW measures moisture content when the upper frontal sensor is placed on the material for half a second. It is also possible to measure through paper or paints. Humidity is determined by contact using a high-frequency technique. Measurements can be taken without damaging the material surface. 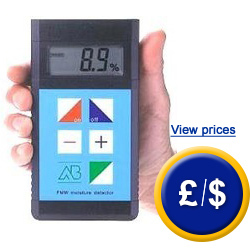 Therefore, this detector is suitable for the use on finished products or for fast controls on site. The material you want to measure is not important. You will only need to put the frontal side of the detector on the material such as: balsa, beech, birch, cedar, oak, pine, fir-tree, mahogany, lime-tree etc or building materials such as parquet. Below you will find the characteristic curves in alphabetical order of all the most important wood types (they are stored in the humidity detector). We can also send another list with more wood types. 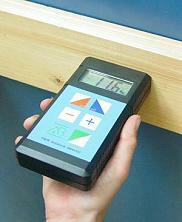 While measuring moisture content in wood, the result will be more accurate on smooth surfaces. The measuring value will grow on chips or knots. If measurements are taken on breaks, the humidity value will be lower in relation to the real humidity value (absolute humidity). In both cases, you will have to measure near the area which is going to be measured. 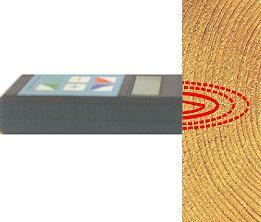 In rough surface wood types, the result displayed in the humidity detector can be lower. The result will not be affected if the measurement is taken either in the fiber direction or against the fiber direction. The measurement depth is 25 mm. If the wood is very thin (e.g. < 1 cm thickness), measurement will be carried out through the wood. The material on the wood will also be measured partially. During the measurement the humidity detector has to be on the surface which is going to be measured in order to avoid mistakes with results. For building materials it is possible to introduce "0" value. For this detector, there is only a single characteristic curve (mean characteristic curve). With the humidity detector FMW-B you will be able to easily determine humid zones in floors, walls, etc. for a relative measurement in wet or weak areas. Measurement ranges 0 ... 60 % H2O for building materials.